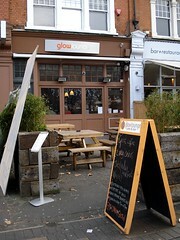 Now closed; was a small cafe on the south side of Clapham Common, very close to Clapham South Station. As of late 2014 the premises are occupied by a shisha bar and restaurant called Sequoia. Small cafe on the south side of Clapham Common, very close to Clapham South Station. Note: Glow Lounge changed hands in early 2011. We haven't visited since the change of management, so some of our comments below may be out of date. It's on the posh side for a cafe; definitely not a greasy spoon, and in fact it turns into a bar in the evening. They have a sofa or two as well as normal chairs and tables. There's natural light towards the front but it's more cosy at the back. Kake and Bob visited for brunch on a Saturday in December 2007; we arrived a little before 1pm and only had a very short wait for a table. Kake had eggs benedict with roasted vegetables photo (£5.85); the veg were tasty enough, though the eggs could have done with slightly less cooking time and the hollandaise sauce was unremarkable. Bob had the Full Monty breakfast photo (£7); he remarked that he would have liked a bit more toast (extra toast is available at £1/two slices). His sausages were real proper tasty sausages rather than the rusk-heavy deep-fried things you get in greasy spoons. Tea (£1.40/large mug) was fine; orange juice (£1.60) was tasty, with bits in, and not too sweet, but arrived with icecubes and a straw for some reason. They have a sign up inside saying that they offer wireless interweb between 8am and 6:30pm and it's a "work free zone" after that. According to their website as of March 2008, wireless access costs £3. Getting here: Come out of Clapham South Station, cross over the road towards the Tesco, turn left along the rather confusingly-named Clapham Common South Side (which actually runs along the east side of the common), and walk up about a hundred yards; it's behind a sort of hedge thing on your right. Food times taken from blackboard outside, December 2007. Wireless interweb info taken from sign inside, December 2007. Last visited by Kake and Bob, December 2007. Last edited 2014-11-22 11:43:14 (version 13; diff). List all versions. Page last edited 2014-11-22 11:43:14 (version 13).